Mixed Europeans with a love of club beats and simple group camping fun on a grand scale. The fireworks capital of Le Mans. Houx Annexe has an illustrious history amongst many long term Le Mans fans. It is where it all started for many. It has evolved from a turn up and camp place in the 1990's to a much more organised site. Before Beausejour was opened it was the largest single campsite. 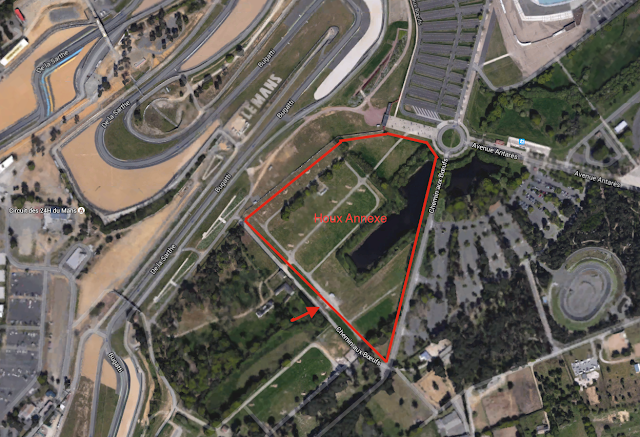 "The Annexe" is situated inside the circuit between the Bugatti track and Tertre Rouge. It offers basic facilities (but getting better) and suits all-comers, from car camping to full size motorhomes. 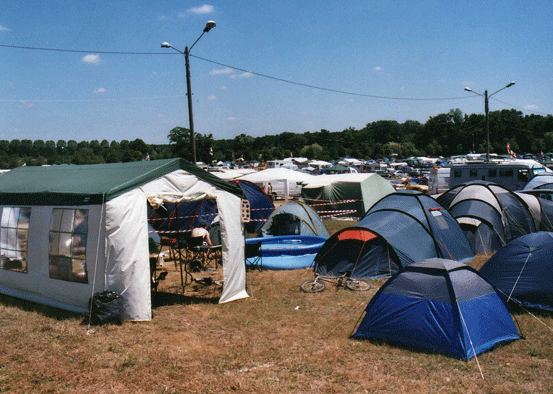 Because of its size and price it used to be the last site to sell out, however it now seems to be the tribal base of choice for many veterans of the Le Mans camping scene. You will need one ticket per car. Pitches are numbered with a few unnumbered ones in corners or where there are trees. The access is particularly good with connecting roads to all parts of the area. The walk to the track is relatively easy (but uphill) and the Antares entrance is close by where the Metro Tram system terminates. Good supply of tickets, access to the tram, well organised site. Easy to get in and out to local roads. Can be overly lively, both of the roads around and on the campsite. Dust is sometimes a problem if very dry and minor flooding when wet. Some pitches sub standard. Much development has taken place in this part of the circuit over recent years. The best news for HA campers is the close by tram terminus which takes you into town for both the huge Carrefour and the Driver's Parade. Once a huge campsite with a large proportion of campsites, it has become smaller and more civilised with the creation of grass ponds and the light industrial estate over the last 10 years. Arrived on the Tuesday after a ferry from Dover to Calais then the drive down after stopping off at Carrefour and McDonalds. Sat Nav was set for the front gates of the circuit but we were politely sent packing around to Houx Annexe. On arrival at the site there was the quickest of searches (feel the bags) and then escorted by bike to our single pitch (AI16) located at the back next to a metal fence. The pitch was rather small and only just fitted the tent and car (next year two pitches! ), then....beers out! The site was good but quite noisy with multiple generators and party's going on until the small hours.....which suited us fine . There was an ok number of male and female toilets and showers which soon became used by all. Lets just say I wouldn't have wanted to be female as they soon got a bit grubby although they were cleaned regularly. It did rain quite a lot but we didn't mind, just added to the atmosphere. As I was new to the whole thing I didn’t really know what to expect, I found a friendly bunch of people around me (did as advised and made friends early) and didn’t suffer at all with anything going missing. Even the “clean up crew” on the Sunday night were polite and were asking where people had gone and left stuff if they could take it. Toilets were under very high demand at times with no real attention paid to ladies and gents and by the end of the weekend they were starting to look a bit tired (holes punched into doors, toilet seats broken or missing) but the cleaners were doing their best to keep them clean. Showers were also equally under demand if you wanted to shower early, queues of up to 30 people waiting at certain points (my top tip is to shower at random times of the day and avoid this!). I’d give it 3 bottles and would go back, I liked the central location within the circuit and it was really handy for the tram into Le Mans on the Friday. Having been displaced from our beloved Maison Blanche, we were allocated Houx Annexe. This year, the site seemed considerably calmer than reputation, perhaps as we weren't the only displaced campers on it. Getting on to site required a glance at, but not a scan of, the car pass and no GE ticket required at all. "Security" were however scanning both people and cars into the other Houx site at the same entrance. The nearest route to the track was either via Houx itself, or, from Wednesday onwards, via slip road between Houx and Houx Annexe. We did not notice any security issues throughout the week but this was a surprise given the lackadaisical approach by those on the gates. The circuit is further away than people would have you believe, especially as the only way off the site is to head to the bottom corner, furthest from the circuit before heading in your chosen direction. One of our campers wore a GPS pedometer and walked a confirmed 72km from Tuesday afternoon to Monday morning, without doing anything particularly crazy. Facilities were somewhat light with four male toilets, seven urinals and a single shower block allocated to the site. Whilst the showers were not noted to go cold once, they did start to cool off at several points. Also, the toilets could have done with being cleaned a couple of extra times throughout the week as the floors rapidly became revolting. In addition, there is still no fixed power on-site. The site was surprisingly quiet for the week with most asleep by ~2am and none of the hooning about we'd become immune to around the tarmac sections of MB. Allocated pitches were a crapshoot with a couple sporting heavy ditches/holes, some becoming swamplike in the rain and many sporting either hard or burnt-out ground sporting a considerable number of nails where bike-fans had recently burned pallets. I would also have been upset to have been allocated alongside the fence, which rapidly became a makeshift urinal for those not enamoured with the hike to the toilet block.